On December 5, 2017, the pathway for faith-based film was forever changed. A brilliant screenplay by Andrew Librizzi was released onto DVD, after having a run in select theaters throughout the United States and Canada in 2015. 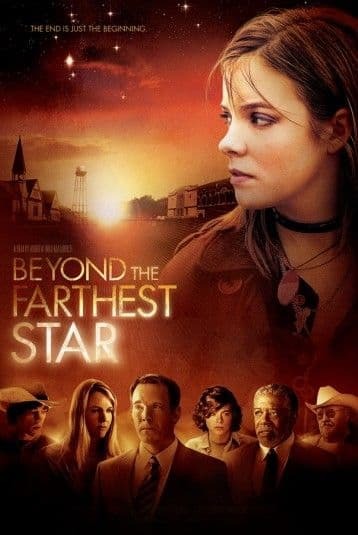 Beyond the Farthest Star sets the bar much higher for films with a Christian message. This film truly captivates the audience, both believer and non-believer, from the first breath of the first scene. The cast, leading and supporting, are so on point that, at some moments, you forget that they’re all just really brilliant actors. The film centers on the Wells Family, Adam (Todd Terry, Arlington Road, Still Born), Maurene (Renee O’Connor, Xena: Warrior Princess, Question of Faith), and Anne (Cherami Leigh, Sword Art Online, Fairy Tale). Adam Wells (Terry), at the age of six was already on the road to being America’s next Billy Graham, has settled for a pastorate position at a church in the small town of Leonard, Texas. His wife, Maurene (O’Connor), plays the part of the faithful pastor’s wife, but she harbors a secret that could destroy her family. Then, there’s Anne (Leigh), Adam and Maurene’s rebellious daughter, who is hurting deeper than she’s willing to admit to anyone, especially her parents. As Adam tries hard to keep up appearances for his new church congregation, and reach his daughter, the burning of the town nativity, begins to char the carefully crafted charade he’s built. Bitterness mixes with sorrow as he and his family learn that beauty can truly come from ashes. The cast is incredible, which is something that can’t be said enough for this film. Cherami Leigh gives a top notch performance, bringing her everything as Anne, and playing the role with such a hard edge that one can’t decide whether to cry for her, or shake her. There is a definite nod to be given to writer Andrew Librizzi for creating such a complex character, and giving teenage girls everywhere someone they can relate to, as well as a mass appreciation for Cherami’s acting talents in bringing life to Anne, and giving the youthful generation something that has been severely lacking. Hope. Nearly everyone that has seen the film has been taken aback by Renee O’Connor’s performance as Maurene. Librizzi wrote such a rich, layered character, that it would be a tall order for any actress to portray Maurene. O’Connor knocks it out of the park. The character is by far one of the most intricately woven parts the screen has seen in a long time. Her character allows the world the ability to see that things are truly darkest before the dawn, and that you can get beauty from ashes. Todd Terry’s performance was exceptional as a flawed pastor, father, and husband. There’s no way you can help but to empathize with him as you watch everything that he loses, and everything that he could lose, unravel before your eyes. The snideness of his character is peppered with just enough humility that his performance makes him identifiable, and a film favorite. The hardest struggle he has is his fall from greatness, but the true struggle he faces is realizing that the life he’s chosen, or that’s chosen him, is worth the cost. One of the things that strikes me the most about this film is how superb the supporting actors were. Seasoned actor Barry Corbin (No Country for Old Men, War Games) as Chief Burns, the sheriff of Leonard, will win you over. Add Andrew Prine (Kiss Her Goodbye, Chisum) to the mix as Senator John Cutter, a slick politician with a less than savory agenda, and you have a cracker jack cast of talent running within the layers of the movie. The filmmakers sought out local talent, and crammed everything into a 21-day shoot, spending three weeks in Leonard and Celeste, Texas, and one week in Dallas and Arlington, Texas, having to alternate between day and night time scheduling, which is no small feat. Andrew Librizzi was exceptional in his role as a director, while Damon Criswell created a score that takes you on an emotional roller coaster ride from the first moment of the movie. Beyond the Farthest Star delivers a message of hope without preaching a sermon. As one who tends to shy away from religious films, I would call this a must see. No matter who you are, we’ve all know rock bottom, but it’s so rare that a film is able to resuscitate you to believing, even on a non-religious level, that there is hope again. Beauty can come from ashes. This film is available at Walmart, Amazon, Best Buy, Target, FYE, Christian Book Distributors, and Barnes & Noble! It’s inspired a novel, Beyond the Farthest Star, by Bodie and Brock Thoene, a painting by Thomas Kinkade, posthumously finished by his nephew Zac, and a song, “Beauty for Ashes” by Dove Award-winning artist, Crystal Lewis. You want this film in your collection. It is so refreshing to have a film that you don’t have to shield from the eyes of children, and it is a definite win to be able to have this added to your collection as a discussion piece for a young teenage audience. While there is so much darkness and negativity in the world, something being in your home that shows you that light can come from that, is a breath of fresh air. This film simply drives away the dark, one ray of light at a time. Trista Holmes is a California transplant with a twist. Originally hailing from Georgia, she has been involved in over 200 theatrical productions, both musical and non. She’s dabbled in the writing circuit, and has since moved on to work in the fields of press release and marketing, when she’s not working on her everyday job.